KAYANZA July 27th (ABP) – People of Muruta, Kayanza and Kabarore communes are called on to safeguard peace and security and to guard all the probable entrances of the perpetrators. That message was delivered by the Permanent Secretary of the Council, Major-General Silas Ntigurirwa, during a meeting held in Kayanza on Wednesday July 25, 2018, for all the heads of services of the said communes, representatives of defense and security forces, representatives of judicial bodies and representatives of associations working for the cause of children and women. Major General Silas Ntigurirwa said that security has many components and is not limited to firearms. He cited, among other things, factors that may hinder peace building and security, and those include polygamy, rampant demography, theft, gender-based violence, family conflict and so many more.He said that the meeting was organized to exchange and analyze together how to strengthen peace and security, saying that security is the basis of stability because once disrupted, all sectors of a country’s life are touched. According to him, for peace and security to be maintained, people must understand their importance. To remedy that, he said, the people of Kayanza, Kabarore and Muruta communes are called upon to safeguard peace and security. Political parties, social class, religious affiliation, and many other differences should not be pretexts for disturbing peace. He asked the participants to do their utmost to ensure that the upcoming 2020 elections take place in serenity. Political parties were informed about communication techniques and the importance of information. They were invited to make a vertical communication and to discreetly deliver the information. 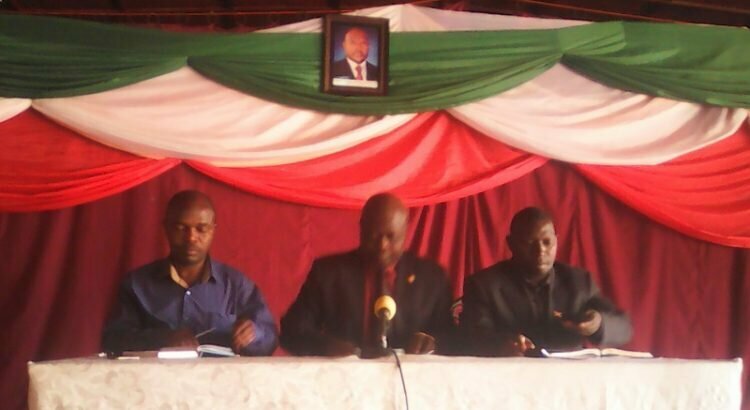 In their welcoming speeches, Kayanza communal administrator Jean Marie Manirakiza and Kayanza Governor’s senior adviser Vianney Ndikumana said that peace and security are not only in good shape in Kayanza, Kabarore and Muruta communes, but also throughout Kayanza province. Mr. Vianney Ndikumana added that the security situation is good, including on the Burundi-Rwandan border. He explained that the security and peace in Kayanza province result from the fact that people have understood that the maintenance of security and peace is everyone’s business. “Despite that, challenges are not lacking,” he said, adding that even if security and peace are maintained, there are still cases of land conflicts and gender-based violence that particularly affect women, cases of torture, and so many more. According to that administrative authority, rampant demography is a factor that disrupts peace and security in that province of Kayanza.